Today we’ve been traveling for eight months. Have a great April’s fools day. We see Nezih passing by on the road when we have breakfast and he comes on over and joins us. Katja reschedule and go with me to BJJ instead of doing Muay Thai this morning and all three of us walk down to Tiger. The BJJ class is good as always, but I do get a real stump in a rib during our sparring. Hopefully it’s bruise and not anything more serious. It’s part of the hazards when training martial arts of course. One bad landing, a punch to hard, a tap out a second to late or just overly tense when doing something. Not different from any other sport or training really. We eat our lunch and spend time on the blog and on writing down exercises from the BJJ training. A lot of the warm ups are going to be used when we return home to teach. Be prepared folks. A long break before our first private trading session. We meet Lam and “his brother” and have a great hour with them. From warm ups to basic striking and then to more advanced pad works. We get correction on movements and the more specific Muay Thai moves and techniques. Something we’ve seen and heard little off since arriving here. We get credit for our punches and kicks, but do lack in the foot work. It’s different than Karate, kickboxing and other things we’ve trained. 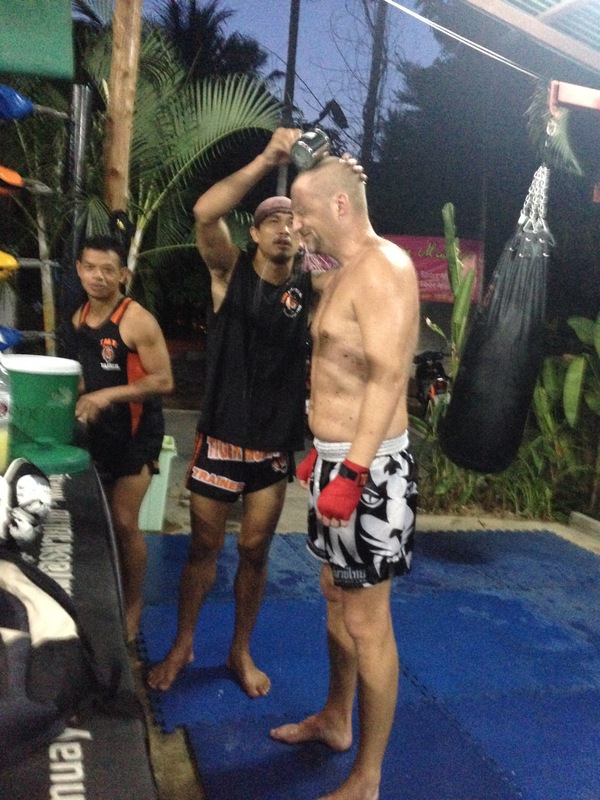 During the training we get rubbed down with ice water like they do in the pauses in fights. Holy crap, that’s cold. It’s refreshing as well, but not without shivers. We agree on another session tomorrow at the same time and hope this will take us a step or two up in technique. We end the night by trying to watch Hercules, but damn that was a crappy movie. Talk about shivers. Thank you for providing tv shows, Netflix. Wonder how my toe is after the training?